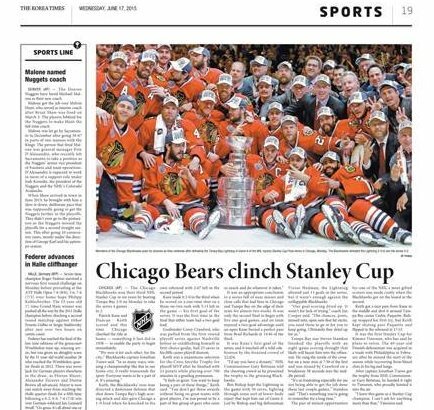 2015: “Chicago Bears clinch Stanley Cup,” declares a headline in the Korea Times, a victory that would have made the Bears the first NFL team to win an NHL championship. It was Chicago’s hockey team—the Blackhawks—that won the Cup just days earlier. 2009: Former NFL quarterback Ryan Leaf—the second overall pick in the 1998 NFL draft—is arrested by U.S. customs agents as he returns to the U.S. from Canada. Leaf is charged with burglary to a habitation (a second-degree felony), seven counts of obtaining a controlled substance by fraud, and one count of delivery of a simulated controlled substance. 2000: New York Yankees second baseman Chuck Koblauch commits his 13th error of the season, throwing a ball into the stands and hitting a woman sitting behind the first base dugout during a game against the Chicago White Sox. 1993: Apple Computer’s board of directors hold a special meeting to address the company’s financial woes, and ask president John Sculley to step down from his position.